If you like cooking or baking at home and are interested in taking your work to the next level, a stand mixer is a great investment. Good stand mixers are versatile enough to handle even the most heavy-duty jobs that are thrown at them (including stiff doughs, marshmallows, and other recipes that include thick batters or long mixing times), saving you time and arm fatigue. 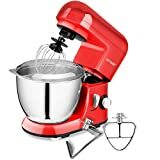 When you find the right stand mixer, it will give you years of reliable service, make working in the kitchen much easier and more pleasurable, and will probably help make you a better chef. With all these benefits in mind, here are some things that will help you find the right mixer for your needs. Tilt-head: Tilt-head mixers, as the name implies, feature heads that tilt up and down, allowing users to access the bowl to remove it, add ingredients, or scrape down the sides during mixing sessions. Lift: With lift mixers, the bowl is raised to meet the mixer head (which is fixed in place) or lowered to remove it from the mixer or add ingredients. 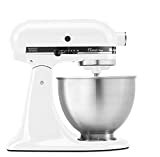 Hand mixers: The third type of stand mixer adds a stand to a traditional hand mixer, which can be detached and used by hand. 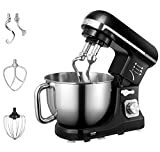 These mixers are less powerful and durable than typical stand mixers, although they are more flexible in terms of how they can be used. 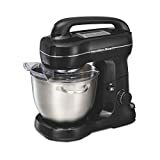 Motor durability: The purpose of a stand mixer is to do heavy-duty mixing, and be able to do so for a long time. The best models are ones that can handle any mixing job that’s thrown at them and be able to keep working for years. 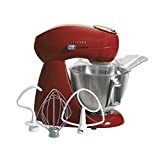 Ease of loading and contact: In order to do its job properly, a mixer needs to be easy to load (it shouldn’t be a hassle to access the bowl) and once loaded, the mixer attachment—whether a whisk, paddle, or dough hook—needs to be able to reach ingredients even at the bottom of the mixing bowl. 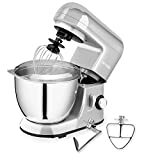 Great mixers allow both the chef and the mixer to access the bowl with ease. 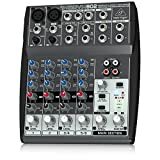 Stability: Because it generates a considerable amount of force, a mixer may move across the counter, especially during long mixing sessions or when operating at top speeds. A heavier mixer can help mitigate this, and some models also add things like suction cups for added stability. Noise: A stand mixer is a power tool for the kitchen, so it will generate some noise. Better models, however, are able to do their work without being too annoyingly loud. Bowl size: This is an important consideration. Stand mixers come with bowls of varying sizes, so think about the amount of ingredients you typically work with. Choose a bowl size that will serve your everyday needs, with maybe a little extra space for special occasions when you might need to make bigger batches. Controls: Look for a model that comes with simple, straightforward controls; you might just need a mixer that comes with a variety of motor speeds. 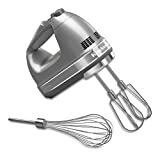 Accessories: Most mixers come with a bowl and three standard attachments: a whisk, paddle, and dough hook. Others come with additional accessories, including covers to prevent ingredients from flying out during mixing sessions. 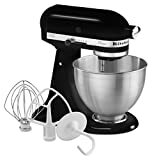 Take a look at what comes with the mixer and pick a model that comes with accessories that you’re likely to use often. 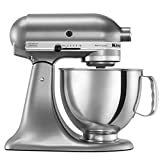 KitchenAid: KitchenAid is practically synonymous with stand mixers, and with good reason. 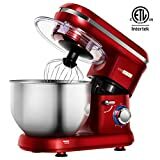 The company has been making stand mixers since 1919 and has developed a reputation for high-quality, durable mixers and excellent customer service. Cuisinart: Cuisinart is an American company that has been producing kitchen accessories since 1971. Perhaps best known for their excellent line of food processors, the company manufactures a wide range of kitchen equipment for virtually every culinary use. Hamilton Beach: Hamilton Beach is an American manufacturer of blenders, mixers, and a host of other kitchen gadgets. Founded in 1910, the company’s products are now sold worldwide.